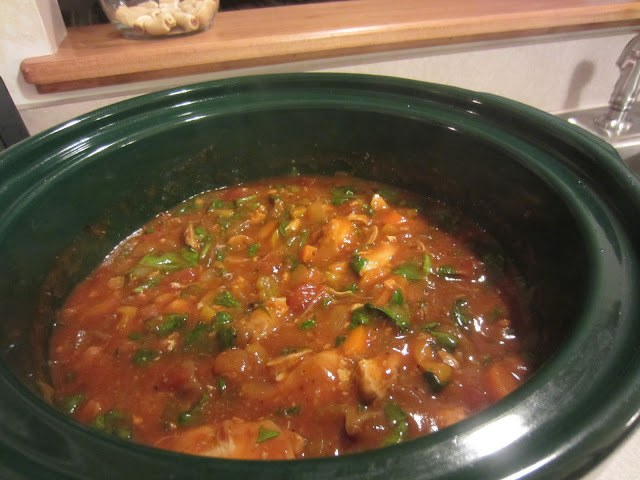 What a delicious and easy crockpot meal this is! Tender boneless, skinless chicken thighs in a vegetable laced tomato sauce over creamy polenta slices. Perfect for a cool autumn day! Super easy to prepare and plate, thanks to pre-made polenta that only requires heating up to serve. Pre-made, store bought, polenta is such a deal point+ speaking too. For two 1/2" slices, it adds only 2p+ to this dish. I sliced the polenta into 1/2" discs, and then sauteed them for a few minutes in a nonstick skillet sprayed with cooking spray until warm. Of course, you could serve this over pasta or rice if you prefer, and it would still be delicious! 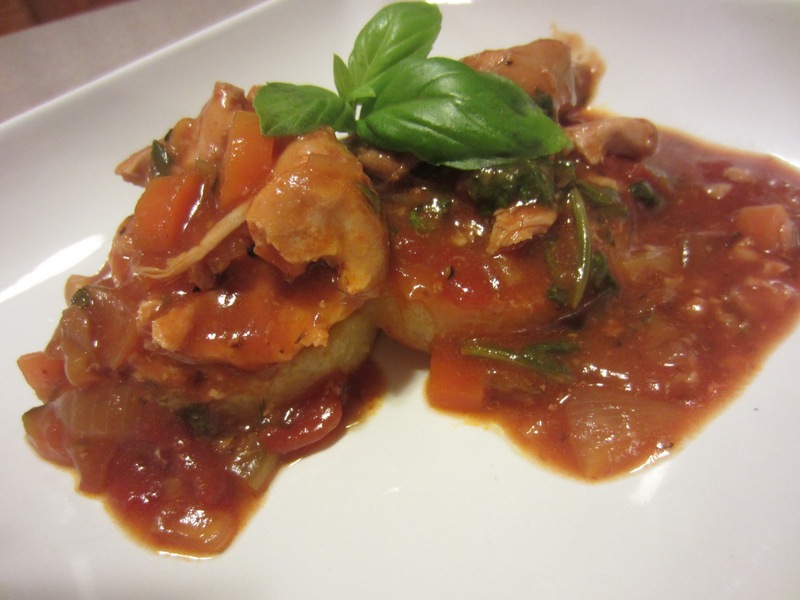 As for the chicken cacciatore, it is basically "a layer and let cook all day" sort of recipe! Only a little extra work at the end, to thicken the sauce and add the spinach, before it is ready to be served. And the best part is, you can thin the leftovers out with some chicken stock for a great soup for lunches during the week! 1. Season chicken thighs with 1/2 tsp salt and 1/4 tsp pepper. Spray liner of a 6 quart crockpot with cooking spray. Place chicken thighs inside the bottom. Add in the green pepper, onion, celery, carrots, mushrooms, garlic and bay leaf. Open can of diced tomatoes and top the vegetables in the crock pot. 2. In a small bowl, combine the tomato paste, chicken stock, wine and balsamic vinegar. Mix well. Pour on top of chicken. Cover and cook on LOW for 8 - 10 hours or until the chicken is tender. Remove bay leaf and discard. This dish was a hit with my family. We really enjoyed it over the polenta slices. Look for the pre-made polenta in the pasta aisle of your grocery store. ( of course, you could also make the polenta from scratch if you wish!) The flavors of this cacciatore are deep and delicious and like I mentioned above, I took the leftovers and added more broth to them to make it into a soup for lunches! You gotta love when you can recreate a dish for another meal! If you haven't left me a comment to enter to win a $25 gift card to Bed, Bath and Beyond, to celebrate my one year blogversary you have until this Friday to try your luck at it! You can find out about the rules HERE. Mmmmmm, sounds like a good one Renee! I love double-duty recipes too! I'm printing this one, it's gonna be cool this weekend! Thanks again! This looks like a wonderful meal. I would like to try it with chicken breasts - I have some family members who don't like dark meat!How many pounds of chicken do you think you used? 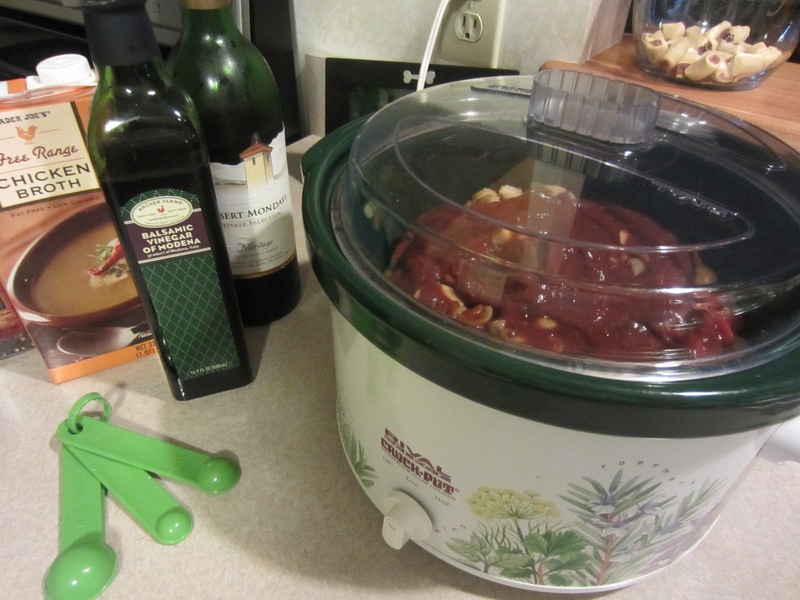 Slow cooker recipes are so nice for busy days. Thanks for taking the time to share this recipe. Thanks Renee! I do other slow cooker recipes with chicken breasts and you are right if I cut back on the cooking time they won't be dried out. I ran to the store and got the ingredients I needed for this dish. It might be the weekend before I get to it but its on my list! I had this for the first time a couple weeks ago and I am obsessed! SO amazing. I bet the chicken comes out so tender from the crockpot. LOVE! I think my MIL made that for my husband when he was growing up - I think he'd love it, especially with polenta, which I had never even heard of before marrying my Italian husband! Hi Renee. Yet another stall recipe from MKA! Thanks so much! I should remember to get polenta more often. I don't think of it, but when we have it, we love it. Have a good Thursday. Renee I wanted to let you know that I made this on Friday using frozen chicken breast and I cooked it on high for 5 1/2 hours. I was out shopping with my daughter all afternoon and when we walked in the door it smelled delicious.I'm happy to say it was perfect! We had it over the polenta in a tube since I was short on time but next time I will make fresh polenta - just because I prefer home made. It was a hit with my hubby and my daughter. We had leftovers for lunch today and it was even better on day two! Featuring this recipe this weekend! Can't wait to try making it! Your Cacciatore looks so delicious, we will really enjoy this recipe! Thank you so much for sharing with Full Plate Thursday. Hope you will have a wonderful week and come back soon! I made this! It was great! It was on A Little Nosh's blog and I made it for the secret recipe club. Thanks so much for sharing! Renee, I made this today and it tasted fantastic. The whole family loved it. Thanks for sharing. thank you so much for the review Michele! I'm glad your family enjoyed it!